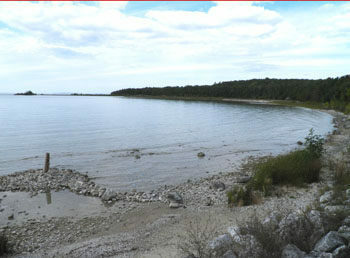 The largest forested tract in the vicinity of Mackinaw City is The Headlands, an Emmet County park that spans over 600 acres and features 2 miles of shoreline on Cecil Bay and the Straits of Mackinac. 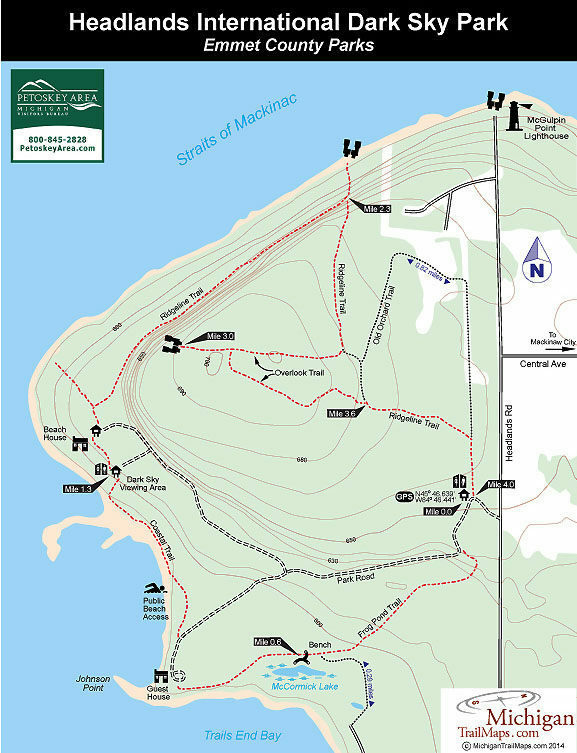 This unique park includes 4.3 miles trail, two rental houses, outstanding views of the Mackinac Bridge and an interesting history. The park is the former vacation retreat of the McCormick family, who amassed its fortune by inventing the reaping machine in the 1800s and then creating International Harvester. Roger McCormick established the area in the late 1950s when he hired a helicopter and dropped 50lb. sacks of flour to mark the boundaries of the property he wanted to purchase. The Headlands remained in the hands of the Chicago industrialist until his death in 1968, when the property was assumed by the McCormick Foundation. In 1966 the Little Traverse Conservancy assisted Emmet County to acquire the tract with the help of a Michigan Natural Resources Trust Fund. 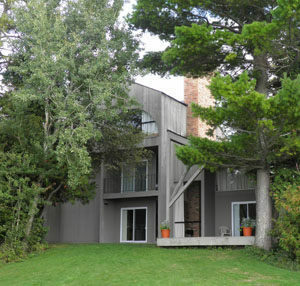 County officials then turned the two McCormick vacation homes, including the impressive Beach House designed by Chicago architect Roy Binkley, into rentals and the maze of two-tracks on the property into a trail system. In 2011, The Headlands was designated an International Dark Sky Park, only the sixth such park in the United States and the ninth in the world. Since then the county has established a 24-hour parking area, trail and stretch of lakeshore for dark sky viewing and monthly programs at the Beach House with a local night-sky expert. Shipwreck enthusiasts will also find The Headlands interesting as several vessels lie just off shore. The woodlands and undeveloped shoreline are home to 20 species of wildflowers a variety of plants, including endangered Dwarf Lake Iris and the threatened Pitcher’s Thistle. Wildlife that can be spotted includes bald eagles, osprey, white tail deer, wild turkeys, coyotes and occasionally even a black bear. The two-track trails are short and make the Headlands an easy hike, off-road bike ride or Nordic ski outing that is ideal for families. A number of loops are possible but the entire perimeter of the trail system is only 3.5 miles. What is described below is a 4-mile loop that includes the most interesting and scenic sections of the park. The main trailhead just off Wilderness Park Drive is where most visitors begin their outing at the Headlands. Follow the Park Road for 200 yards to the well marked junction with Trail. Posted in red markers, Frog Pond Trail winds through a dark stand of cedar before breaking out at McCormick Lake at Mile 0.6 and arriving at the Guest House at Mile 0.8. Follow the Park road to pick up the Coastal Trail, marked in yellow within a 100 yards. The Coastal Trail quickly drops down to the public beach where it is not well marked. It follows the sandy shore for a quarter mile and then becomes a faint two-track that leads away from the water into the trees and at Mile 1.3 pops out at the Dark Sky Viewing Area Trailhead. Follow the Park Road to the left around the Beach House to reach the end of it where there is parking and a trailhead for Ridgeline Trail, the park’s longest at 1.5 miles and is posted in yellow. The Ridgeline Trail quickly passes a spur to the beach and then begins an interesting stretch through a cedar forest where you skirt the base of a steep shoreline bluff, the headlands from which the park earns its name. There is rarely a view of the water through the trees but on a windy day the roar of waves crashing ashore fill the woods. 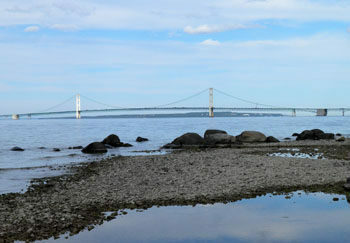 At Mile 2.3 you have another chance to follow a spur, the left-hand fork, to the shoreline and you should as it gives way to an incredible view of Mackinac Bridge and any vessels passing through. The right-hand fork of Ridgeline Trail climbs to the top of the Headlands and within a quarter mile comes to the first of two junctions with the Overlook Trail, marked in green. This 0.8-mile semi-loop leads you out to a viewing point of the Headlands. If it’s May there will indeed be trilliums lining the trail. You return to the Ridgeline Trail at Mile 3.6 and by heading east (right) you will return to the main trailhead in less than a half mile. Along the way you pass a junction with the Old Orchard Trail, a 0.82-mile loop through mostly open fields. At main trailhead is a parking lot, picnic table, information kiosk and a vault toilet. The other two trailheads that offer limited parking are the Dark Sky Viewing Traihead and Voyager Trailhead, both near the Beach House. The park offers two facilities for rental by the public; the Beach House, which accommodates 18 people in two bedrooms, and the Guest House that provides accommodations for 22 people in four bedrooms on three levels. Both have full kitchens and a conference area and are reserved through Emmet County (231-436-4051). There are no vehicle or entry fees at the Headlands. Contact Emmet County Parks (231-348-1704; www.emmetcounty.org) or the Petoskey Area Visitors Bureau (231-348-2755, 800-845-2828; www.petoskeyarea.com).